Meguiar’s Citrus-Fresh Cleaning Wipes take the guesswork out of cleaning. These easy-to-use wipes make freshening up a breeze by providing ultimate dirt removal, while leaving behind a fresh, citrus scent. Without staining or bleaching, these versatile cleaning wipes effectively remove stubborn dirt and grease with ease, from exterior and interior surfaces. Meguiar’s Citrus-Fresh Cleaning Wipes work best on vinyl, trim, carpet, upholstery, leather, rubber, running boards, tires, mud flaps, and more! Washing doesn’t always remove the road grime that plagues exterior running boards and trim or the interior dashboard’s daily wear and tear. Meguiar’s Citrus-Fresh Cleaning Wipes are designed to easily clean those surfaces while restoring them to a like-new appearance. This versatile formula is gentle enough not to stain or bleach surfaces, but tough enough to remove stubborn dirt, grime, and grease with ease. 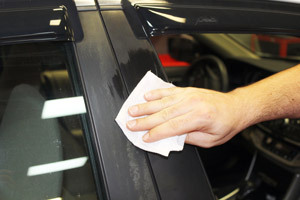 Meguiar's Citrus-Fresh Cleaning Wipes clean both the inside and the outside of your vehicle! To use, remove one wipe from the container and wipe along the intended surfaces, removing dirt and grime. Keep turning the wipe to a clean side for best results. Pair it with Wolfgang Leather Care Cleaner for an extra citrus boost!